Garfield is an age old, much loved comic/cartoon. 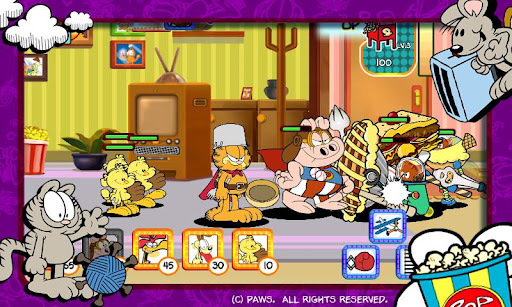 Garfield’s Defense is an action strategy side-scroller game for Android which, as the name may indicate, features characters from the Garfield comic. You play as Garfield in Garfield’s Defense. Earth is being invaded by aliens who attack your fridge to transform your food into vehicles and weapons which they will then use to take over Earth. The goal of the game is to defend your fridge against these invaders. Using comical weapons such as forks, rolled-up newspapers, toy launchers, etc. Garfield, with your help, beats back the aliens on each stage; to help beat back the aliens you have the option to call ‘friends’ (Odie, Nermal, Wade, Orson, Arlene, and Jon) whom help fight the aliens and use special weapons, such as a punch-in-the-box. As you progress through the game you have the ability to upgrade Garfield, friends, and weapons using cookies which you either collect or purchase via in-app purchases. Aside from the gameplay, another fun aspect of the game are in-game sounds and commentary from the likes of Garfield. 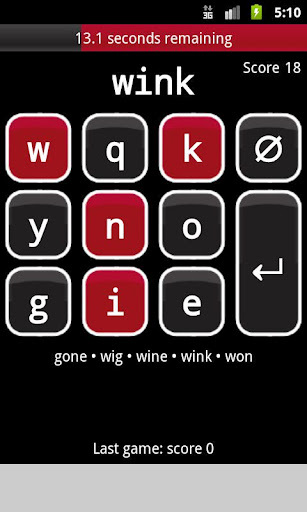 Word Weasel is a word game in which you are given nine random English letters and you must create as many English words out of those nine letters as you can think of within fifty seconds. At the end of the fifty seconds you are scored based on how many words you created, with one point for each letter used. Word Weasel uses SOWPODS word list which contains over 100,000 words (many of which are obscure but real). By design Word Weasel is created to be a social game — it is intended to be played against other people online. However, you can play Word Weasel offline, too, so if you don’t want to or can’t play online then don’t worry. In the recent past various countries in the Middle East have faced what is dubbed as the ‘Arab Spring’. Inspired by these events, Paramount Pictures released a comedy film “The Dictator” which is “the heroic story of a North African dictator who risked his life to ensure that democracy would never come to the country he so lovingly oppressed”. The Dictator: Wadiyan Games is a comical Android game based on The Dictator (the movie). 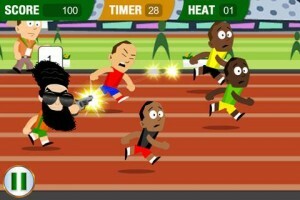 In The Dictator: Wadiyan Games you control General Aladeen, dictator of the country Wadiyan. Aladeen is taking part in Wadiyan Games, which features General Aladeen’s four favorite events: running, boxing, fencing, and swimming. The comedy is Aladeen doesn’t play fair in either of the events. In running you use guns and rockets to kill other participants, ensuring you win the race. In boxing you use brass knuckles, iron claws, and a robot to beat the crap out of your opponent. In swimming and fencing you do similar things (e.g. using a sword while fencing or a boat while swimming) to ensure Aladeen gets gold. To compliment the ridiculous gameplay there is Aladeen commentary in which he makes disgusting, yet still funny, remarks such as “you have another arm” while beating the **** out of the other person in boxing or telling someone to “clean up the blood” after a boxing round. The Dictator: Wadiyan Games itself is free. However, the free version only has running and boxing. If you want to fencing and swimming you need to make an in-app purchase of $1.99 (which is temporarily available for $0.99 in a 50% off sale).